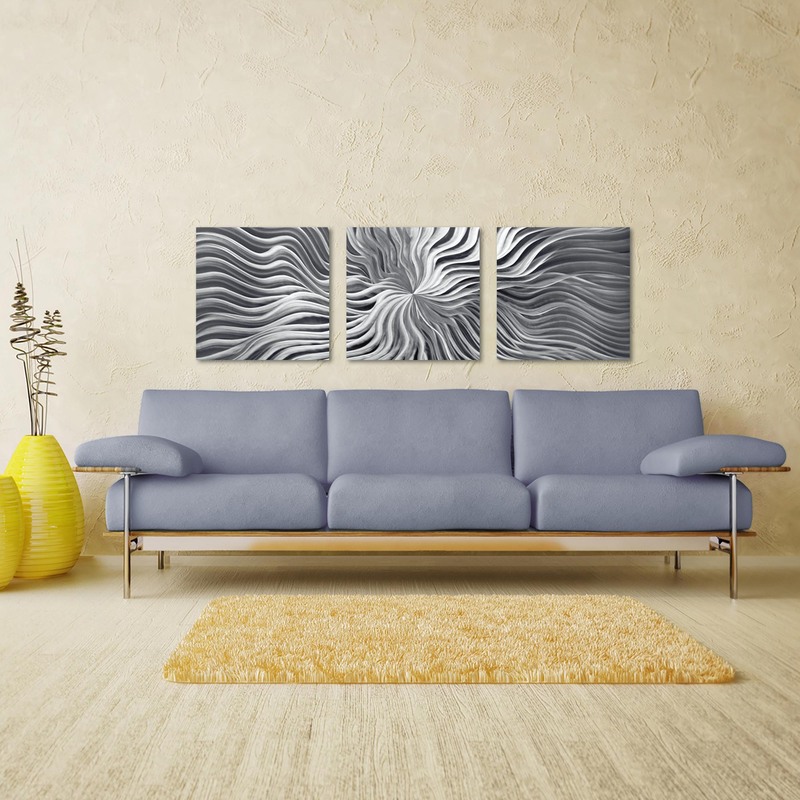 Flexure Triptych Large is a contemporary style piece based on the original artwork by the talented artist NAY. The original design has now been converted into a three panel giclee print, with all of the detail elements and attractive personality that the artist intended. 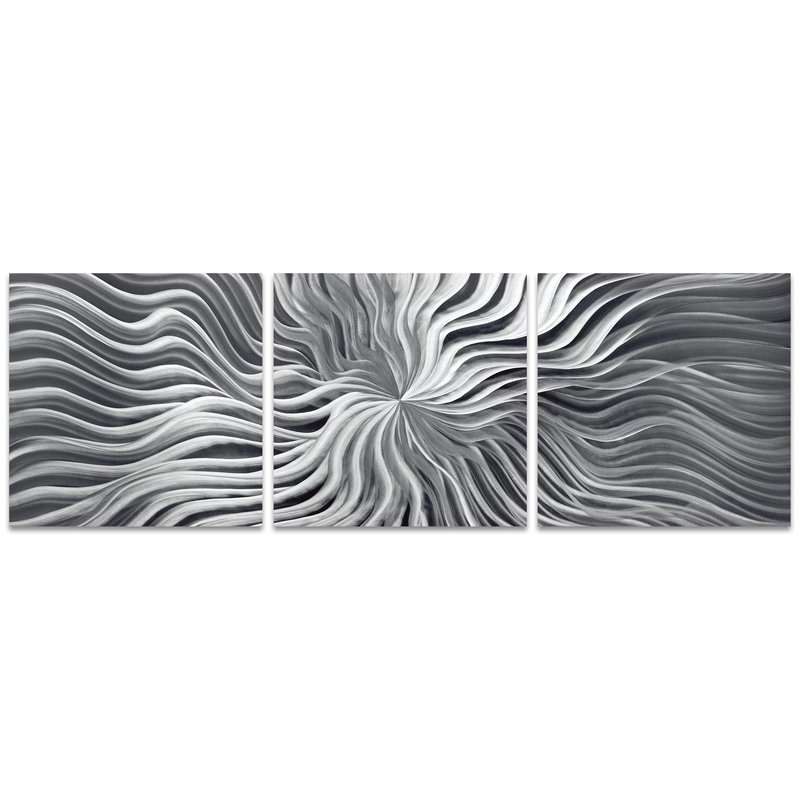 This unique tiled display is perfect for decorating with a contemporary emphasis. Because this wavy starburst art is crafted from strong, rigid materials with durable finishes, it is weather resistant and suitable for both indoor and outdoor settings. These inherent qualities coupled with the creative artistry make this collection popular with high-end corporate settings, luxury hotels, and urban decorators. The design features crisp, clean hues of gray, black, white and monochrome on metal or acrylic with an attractive matte or glossy finish. This metal sunburst decor and minimalist wall artwork is a creative addition to our Contemporary Style Wavy Starburst Wall Art collection. Detail: HD (high definition) giclee print application. UV cured acrylic inks. Rare, true-flatbed application for ultimate image clarity. 100% Made in USA: Enhanced, prepped, printed and assembled in our Cincinnati art studio. 90 Day Manufacturer Parts Warranty. Mounting: sawtooth metal brackets attached to the back that hang easily on nails, screws, hooks or french cleats, and allow the artwork to float slightly off the wall. Finish/Care: Suitable for indoor/outdoor placement. Artistic matte or glossy finish on metal or acrylic. Wipe clean with soft cotton cloth, and if necessary, warm water and a mild hand or dish soap.